We no longer accept bookings through VRBO so please Find us at Coloma Cottages on the www. 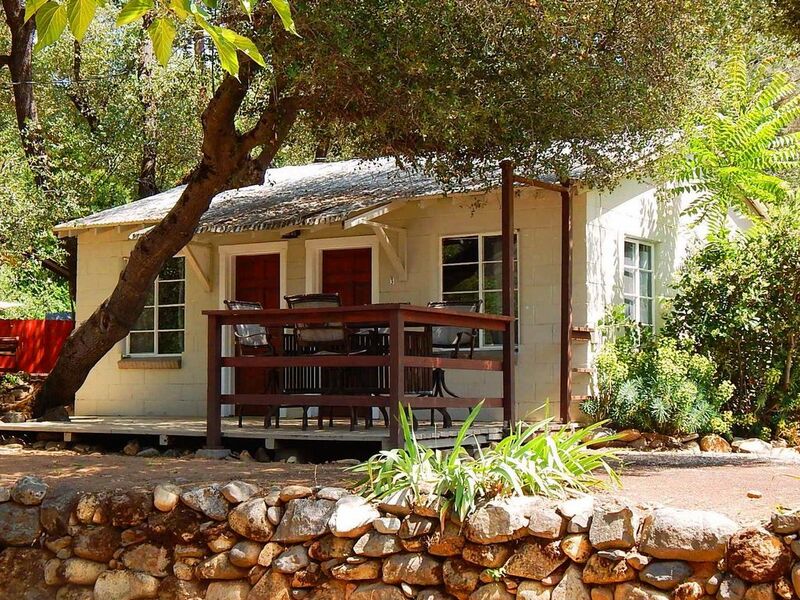 Historical cottage located on the bank of the South Fork American River! Our cottage has one bedroom & one bathroom, a queen sized bed & futon. It is stocked with cooking utensils, fresh linens, towels, coffee, shampoo, heat & air. You can hear the sound of the American river just outside your door. Discover the sleepy town of Coloma by taking a walk to the Marshall Gold Discovery State Park. Or find an adventure by going whitewater rafting, wine tasting and so much more! Our cottage is in the heart of the Gold Country! Our cottages are within walking distance to historical sites, food & small store. We accept reservations April through October. Fresh towels, TP, shampoo, soaps, blow dryer, complimentary insect spray & sunscreen. Love the title of the cottage. We arrived early and the cottage was clean a huge plus. We were able to check in early and check out without pressure. We loved the location right on the river and we met some very cool people. The bed was very comfortable and it was cool to see mama doe and her two babies with her. We will definitivelly put this on Facebook and tell our friends about it. Hope to come back in the spring and thank you so much to Danika she's such a doll. Thank you so much! Come back again soon! I planned a river rafting trip for my company. We rented 3 cottages on DJ's property. It was wonderful! The river access was awesome. Having a nice kitchen in each of the cottages made hosting super convenient. The fire pit area was excellent and there was a ton of parking. It was also within walking distance to American River Recreation/American River Resort where we had our river rafting planned. It was an awesome weekend, and I would highly recommend doing a full buy-out of the cottages if you're looking to entertain a large group. We were a little big, and one cabin had already been rented but they were super nice and understanding! There is very limited lodging in Coloma. I first attempted to stay at the Coloma resort which was very loud and crowded. What a relief it was to reach this cabin. It is quiet and beautiful and very close to town, the market, and right on the river. The cottage had everything we needed and the owners were very on top of things. They are very helpful and friendly people to rent from. And the prices are very reasonable for the area. I have nothing but good memories staying here and highly recommend it to others. A simple cinder-block cottage from the outside; a luxurious, very well-appointed oasis inside. Bed so high you need a ladder to climb in and sink deep down. Kitchen with everything needed, and everything in excellent condition. Keurig coffee-maker and lots of pods. Full-size fridge! Comfortable futon in living room. Small but efficient bathroom with a good shower and a toilet that didn't stop up once. Air-conditioning for the heat of the day, windows to open to capture the cool of the night. Weber barbecue, bar with stools provided on deck. Steps from the foot of the Troublemaker rapids and a short clamber over boulders to reach a point from which to watch rafters and kayakers shoot the rapids. Around the other way is Marshall Gold Discovery Historical State Park, literally a five minute walk from the cottage. I can recommend the gelato at the Argonaut cafe! Jeff and Danika have done an incredible job and are wonderfully hospitable. I thoroughly enjoyed my stay and will be returning. What a fantastically detailed review! Thank you so much Robert. You are most welcome anytime and it was a pleasure having you. Until next time ~ Cheers! We had a great stay at the Coloma Cottages. Jeff and Danika were very personable and attended to everything that we needed. The cottage was nicely decorated and had everything that we needed to cook our own meals. We had our own river access and were able to sit on the shoreline and watch the excitement float by. Looking forward to doing it again next year. My husband and I were traveling through Coloma and stopped by the community market and asked if they knew of a place to stay for a few nights. The clerk told us about the Coloma Cottages and gave us the owners contact info. When we arrived the owners met us and showed us around. We were so surprised at the wonderful hidden location of these cute little cottages ON THE RIVER! The cottage was clean, nicely decorated and had everything we needed. In fact we decided to cook a meal instead of going out, just so we could dine by the river. An experience we've never had. We slept with the windows open so we could hear the water and we had a great nights rest. Coffee on the front deck and a walk to the state park & museum the next day. Truly a wonderful experience. We cannot always update our calendars due to time constraints, so please contact us for certain availability. Please note that we do not charge cleaning fees :) but we ask that you do your dishes and take out your trash. Thank you!